Oh, Duncan, You Crazy Nut! What Walks Down Stairs, Alone Or In Pairs, And Makes A Slinkity Sound? 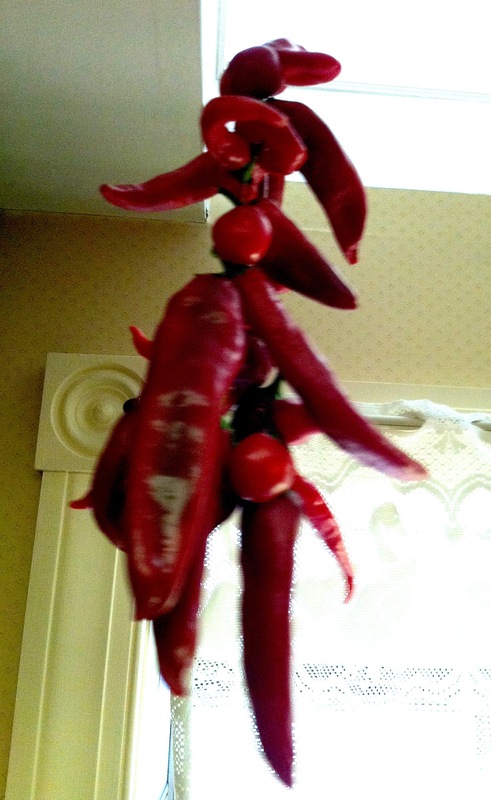 The Peppers Were Hung By The Window With Care . . .
My pepper saga continues as I look for ways to use up these darned things. Today’s experiment takes the form of me threading some peppers on thin cotton twine and hanging them above the kitchen window. Will they dry nicely and become a tasty addition to my food over the coming months? What do I look like to you; the Answer Man? I have no idea. Patty will probably fling the entire string into the trash as soon as she gets home, but for now they look attractive and even festive. I sense some resentment on their part, but peppers are known for their cranky temperament and I refuse to let their attitudes get to me. For those who haven’t been paying attention, my crop is composed of ampuis, cowhorn, cherry, and Anaheim peppers; they aren’t hot peppers but spicy.